Pip Gresham began making Suicide Bunny premium e-liquids in 2013 with the original goal of helping her husband quit smoking. After seeing his successful transition from cigarettes to vaping, her mission grew to save as many lives as possible by giving vapers a superior premium e-liquid and creating a better, overall vaping experience. 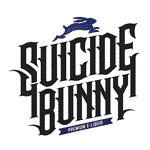 With carefully-selected, quality ingredients, child-resistant droppers, and thirteen flavours, Suicide Bunny e-liquids are designed to help reduce the health hazards associated with smoking cigarettes.